Sinningia amambayensis has defenses against small insects. Obviously, Sinningia amambayensis (like its sticky kin S. araneosa and S. aggregata) does not make those gooey hairs for nothing. The picture shows a likely reason. There are three gnats in the picture, all stuck firmly to the plant and all quite dead -- one on the stem just above the left flowerbud and two on the leaves to the left. I don't think gnats are any menace to this species, but presumably in its native habitat, it is exposed to hostile insects or mites, against which its stickiness is a defence or deterrent. This plant is one of three cuttings put down two months before this picture was taken. 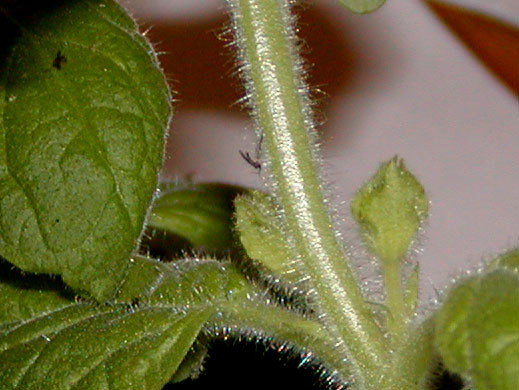 All three shoots had flowerbuds when they were removed, all retained the flowerbuds through the rooting process, and all are growing vigorously at the time of the picture (mid-July 2006).